Thirteen teams from across the country submitted their entries. At the beginning of National Catholic Sisters' Week, the entries were shared on our social media for voting through likes, shares and comments during the week. 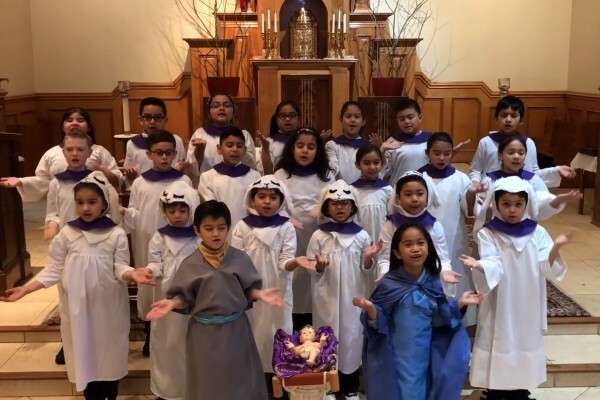 We are excited to announce that Immaculate Conception School’s first grade class in Grand Prairie, TX won with their “23 Singing Sheep” video. Each member of the team will receive a $50 gift card to the store of the team’s choice along with a pizza party. Sr. Loretta Rose Tallas serves as a second grade teacher and Sr. Marie Kim Tran serves as a pre-k teacher at the school. Second place went to The Derpersons from St. Katherine of Siena Parish in Philadelphia. This team will receive $25 gift cards to the store of the team’s choice along with an ice cream party. And, third place went to Immaculate Conception School’s “4th and 5th Grade Crusaders” video. This team will receive $10 gift cards to the store of the team’s choice along with an ice cream party. To view an announcement of the winners, click here. To view all of the videos, go to the Sisters of the Holy Family of Nazareth Vocations – USA Facebook page at facebook.com/NazarethVocationsUSA.